The Electronic Cafe International (ECI) of Santa Monica, California is in operation at SIGGRAPH ’92, providing a forum for tele-interactive art. Through ISDN networks, voice lines, and videophone, SIGGRAPH ’92 is connected to mobile ECI at Dokumenta 9 in Kassel, Germany and La Cite’ s (Paris’) Man and Communication exhibit. Both of these events are simultaneous with SIGGRAPH ’92. They are geared toward mass audiences and feature compressed video transmissions of performances taking place at the two sites, remote control of environmental conditions, collaborative painting, and other uses of the network. Additional connections exist to Japan and the rest of eastern and western Europe, including Bulgaria. During performances in France and Germany, those sites act as hubs linking participants to the SIGGRAPH site. 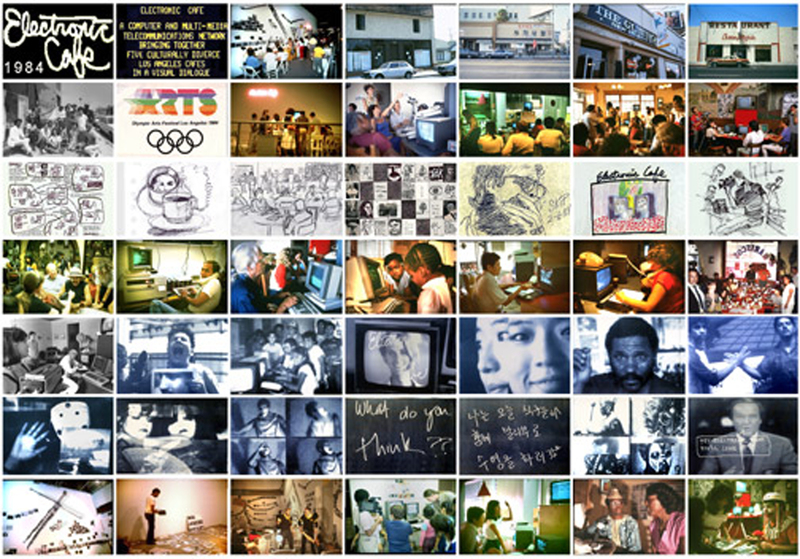 Chicago acts as a hub for still imagery ( from the US, and participants in Chicago are connected to all other sites around the US and the world.